Last week, Oscar and I went to see Dr. Carnegy for a 2nd opinion (3rd really, as I don't discount Shelly Beazley's opinion!) on the condition of Oscar's legs and the recommended course of treatment. Dr. Carnegy has confirmed that Oscar did indeed have a complete separation of his Anterior Cruciate Ligament in his left leg. In addition, the patella in his right leg was also causing mobility issues. A health exam left Dr. Carnegy with the opinion that despite Oscar's age (12 years) and his Grade 4 heart murmur, Oscar is actually quite stable and should withstand surgery/anesthesia without any complications. The alternative, non-invasive treatment would be to buy a brace, but in all likelihood, Oscar would require one for each leg; it would be an expensive purchase, long-term use, and there would be no guarantee that this ACL injury would heal like the January 2009 injury did. 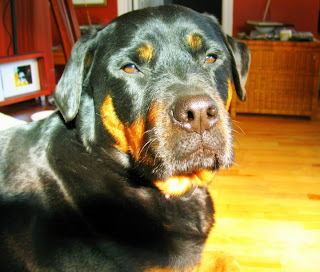 Dr. Carnegy indicated that "if it were MY dog", he'd choose the surgery. Hearing that he believed Oscar's heart was stable enough to go through with it was all I really needed to hear. On July 21, 2010, Oscar will undergo surgery to repair the ACL injury, and will also have his teeth cleaned at the same time. Will be nice to know that he doesn't have gum disease, although I wouldn't be 100% surprised if a tooth or two is extracted as some of the ones out front are looking quite dark (dead?). He will be treated with therapeutic laser following surgery to help speed the healing time, and if necessary, I'll continue to take him for therapy with Shelly. Time will tell if Oscar needs surgery on his right leg as well, but hoping not! Adina MacRae, of Sublime Canine, placed a bulk order of Thundershirts a couple of weeks ago, and I was quite fortunate to be among those who placed an order for two shirts (a medium for Oscar and and XL for Delta). With its patent-pending design, Thundershirt’s gentle, constant pressure has a dramatic calming effect for most dogs if they are anxious, fearful or over-excited. It is this pressure that has a dramatic calming effect for most dogs if they are anxious, fearful or over-excited. 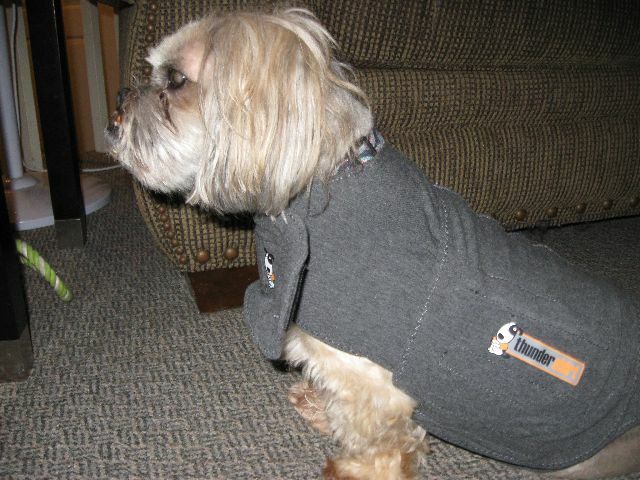 From real world experience, we know with certainty that Thundershirt DOES WORK. Delta and Oscar are both fearful of thunder & lightning, and fireworks. It's my hope that when either events happen, the shirt will help reduce, if not eliminate, their behaviour (shivering/shaking, panting, leaning). 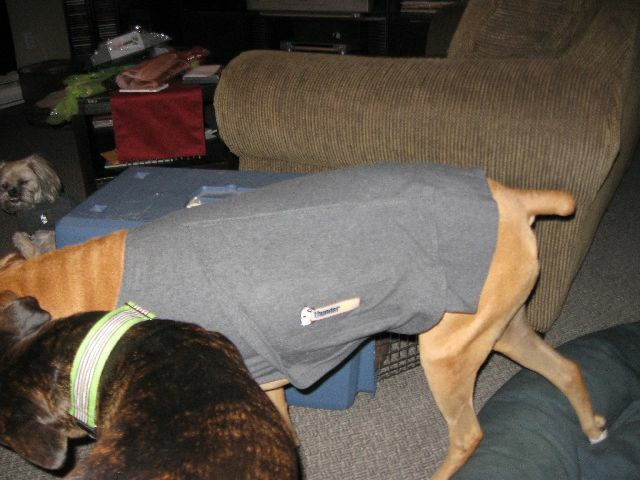 Delta wearing her thundershirt. She was pacing a bit, and trying to rub the shirt off when I put it on her for the first time. She soon calmed down. Oscar wearing his Thundershirt. He was very calm wearing this. The next night, there was a forecast for thundershowers. While I didn't hear them, he could certainly sense or hear them. As soon as he started shaking/shivering, I put the shirt on him and within 2 minutes, he was calm and able to fall asleep. This is great! The true test will be to see if we get the same result with actual loud thunder, and fireworks. Brosa did not receive a Thundershirt of his own as he appears not to have any of those phobias. Such a relief! 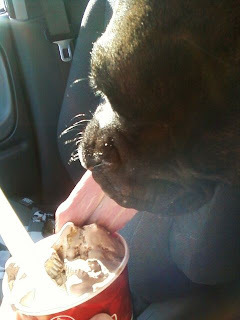 Brosa came with me on the ride to pick up the Thundershirts, and on the way home, I stopped at Cold Stone Creamery in Bedford, NS, to pick up a small cup of ice cream with my birthday coupon. I couldn't help but share some with him! 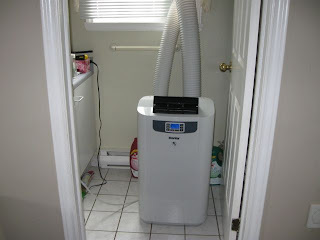 I bit the bullet last week and bought a portable Air Conditioning unit. 6 years I've spent in this house, which has direct sun all day long, and 5 summers of saying "I'll wait until the end of summer sales are on". Well, as we all know, life usually has other financial plans for us! This year, the humidity has come on like gangbusters and it's only the first 2 weeks of July! Therefore, I made the decision last Thursday night to go purchase a unit (after much debate on portable vs window installation) and bring it home. Thanks to Kent for having a Danby unit on sale! It's currently installed in my powder room but I plan to buy a piece of Plexiglass cut to size for my casement window in the living room. It makes a HUGE difference in how my house feels. Now I no longer have to worry about the comfort level of the fur-kids while I'm at work, and also know that Oscar will be comfortable during his recovery from surgery. I wish I would've known about the thundershirt order - I came home to my bathroom carpet all scrunched up and full of pee today after work because Charlie gets all freaked out by heavy rain when he thinks there's going to be thunder and he goes into the bathroom and pees on the floor and hides in there until everything is over. Poor Charlie! Oscar will hide behind the toilet if I'm not around. The notice re: the order was on her wall on FB, and I think that was the only notification given seeking interest in the shirts. Wish I'd known it would be something you'd want for Charlie. The shirts are a great price though and may be well worth an order. Check with Suzanne too - I believe she plans to order some for Mountain Dog Lodge guests.